America’s Brandt Snedeker carded the 10th sub-60 round in PGA Tour history with an opening 59 in the Wyndham Championship in North Carolina. Snedeker recovered from a bogey on the 10th, his opening hole, to card 10 birdies and an eagle at Sedgefield Country Club and set the early clubhouse target on 11 under par. 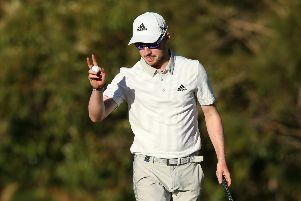 The 37-year-old hit four birdies in a row from the 13th to reach the turn in 32 and picked up four more shots in the first five holes on the front nine before holing his second shot to the sixth for an eagle two. Snedeker’s approach from 176 yards flew straight into the cup with such force that it damaged the hole and forced tournament officials to cut a new hole a foot away, but it had no effect on the world number 88’s concentration. A birdie on the seventh was followed by a miss from six feet on the next, but Snedeker then holed from 20 feet on the ninth to break the magical 60 barrier with an incredible inward half of 27. “I was pretty upset [after the eighth] because I knew you’re not going to have many good looks to shoot 59,” Snedeker told PGA Tour Live. “I kept telling myself after I birdied number seven, I’ve shot 60 out here before in China one year; you do this to shoot 59 so quit worrying about it and hit two fairways, give yourself two good looks [at birdie] and make one of the putts. “Unfortunately I left myself one of the hardest four-footers you can have, a downhill right-to-lefter and I didn’t hit a great putt. “I kept telling myself on nine, I don’t care if you four-putt, three-putt, but do not leave this putt short and luckily it held in there and went right in the middle. What a cool day. “I just had a feeling I was going to do it, didn’t want to try to shy away from it at all. Last time I shot 60 I had a chance on the last two holes and kind of shied away from it and today I wasn’t going to do that. “I found something on the back nine and started hitting a bunch of great iron shots and those days are fun. It’s why we play in practice and put all this time in to have days like this. Ryder Cup captain Jim Furyk holds the record for the lowest score on the PGA Tour with a 58 in the Travelers Championship in 2016. Furyk also shot 59 in the BMW Championship in 2013.